Music: Tedeschi Trucks Band, Revelator. If you haven’t heard this album, go listen to it now. Please, I beg you. It recently took home a Grammy for Best Blues Album of the Year. It deserved it, plus some more. It is real music. It is amazing. It is breathtaking and rowdy…it’s got something for everyone. So, collard greens. You either love ’em or you hate ’em. 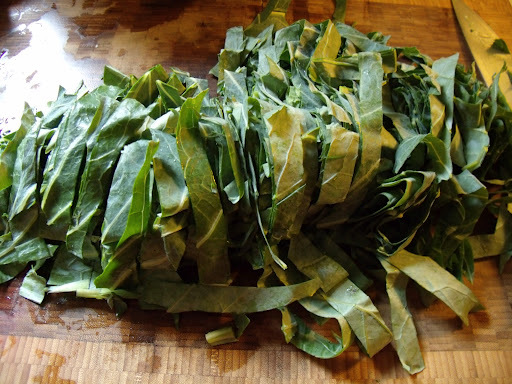 I LOVE ’em, This is a classic southern preparation, but I love collards prepared almost any way. Most recently, I’ve been digging them raw. Thinly sliced into ribbons, left to marinade in a vinaigrette for a fresh and crunchy salad. Or in veggie juices. But this one pot meal is a great one to have when you got a whole lotta greens to cook. So let’s start with how to prepare them. For a quicker braise and simple dish like this or most dishes that call for collards, you should de-stem them. The stems are tough, fibrous, little buggers. You can use the stems, but it is still recommended that you de-stem them and then chop us the stems to be added to your aromatics. Or add the stems to your compost, chicken run, or even your juicer…which is where mine will be headed! 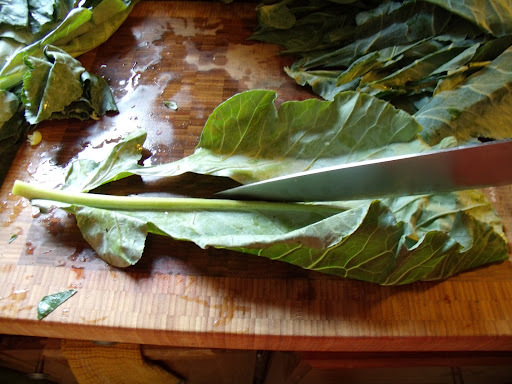 Lay a full leaf down, rib side up, so the underside of the leaf is facing you. Then all you have is two cuts. I was taking pictures with this knife in my hand, so sorry they aren’t the best. Your first cut is right only the rib on one side. Cut all the way down until the stem loses most of it’s width. Then do the same to the other side and cut all the way across the stem to detach. Repeat. A bazillion times. 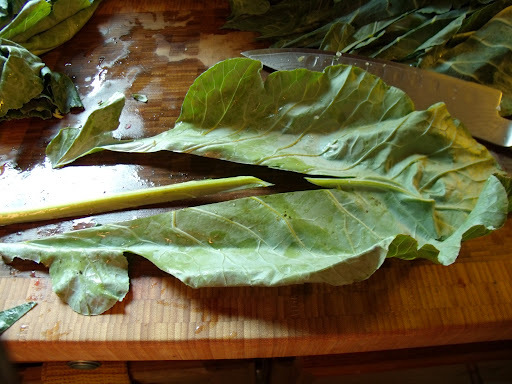 Allow plenty of time to prep collards. It takes longer than you think, but you get into a nice little rhythm, especially if accompanied by an album like Revelator! A note on the sausage. 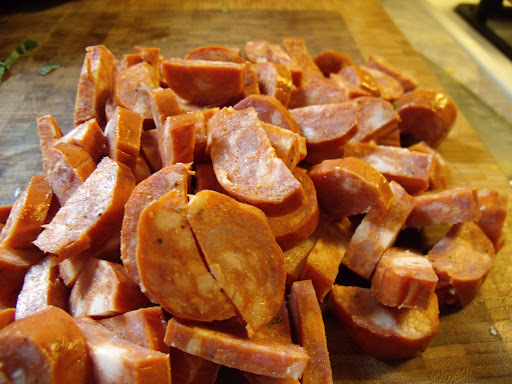 This is really good andouille sausage. If you can, find some. Steer away from any big name sausage companies, ahem, Johnsonville, and branch out a little bit. I know this isn’t always available to everyone whether it be the price tag or selection, but really good andouille sausage it really good and you can taste it in this dish. I think one of my most favorite colors in the world is the bright green that leafy greens turn when just barely cooked. Kale, collards, even spinach all achieve this color just as they become heated. The color they become after cooking is not what I’m talking about, but this bright, vivid green is just lovely. 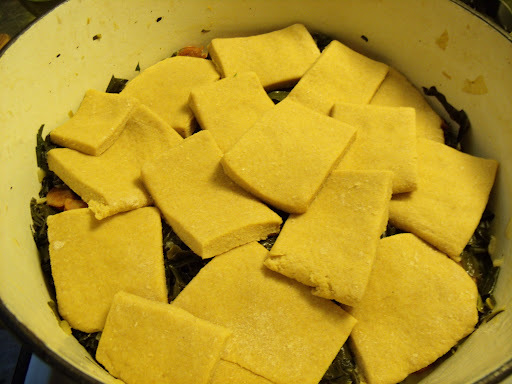 Once the collards cook down and you hit them with some thickened milk, it’s time to lay the biscuits down. Grind some fresh black pepper on top and throw them in the oven. Make the cornbread biscuits. Throw flour, cornmeal, baking powder and salt into your food processor. Give it a whirl. Add the honey and butter and pulse until the butter is in small pieces and looks like small peas. Add buttermilk and pulse until dough comes together. Remove dough onto a floured surface. Knead together until it comes into a pliable dough. You may need to add some more flour or cornmeal. Roll dough out to 1-inch thickness and cut into rectangle biscuits. Lay biscuits on a parchment-lined baking sheet and refrigerate until you’re ready for them. In a large pot (you have two options here – cook in a large pot and then pout finished collards into a baking dish or cook in your baking dish, you can see I cooked in my large dutch oven) over medium-high heat, add sausage and brown. Your sausage may or may not need some extra fat, so have some EVOO on hand just in case it really starts sticking. Turn heat down to medium. Push sausage to one side when you have some nice brown edges and add onions. Saute in sausage fat until translucent, about 8 minutes. Add garlic, saute 1 minute, until fragrant. Add stock. Raise heat to bring to a simmer and turn back down to maintain this simmer. 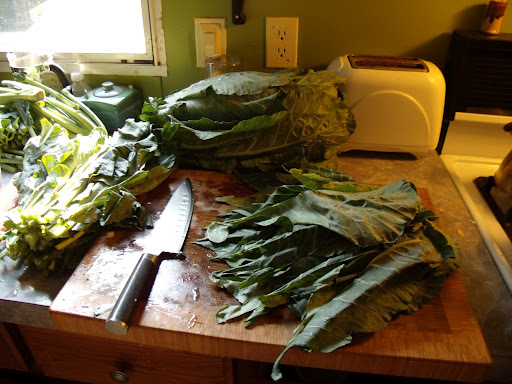 Begin adding collards in batches, stirring to incorporate. Each batch should take on the vivid bright green mentioned above before you add the next batch. It took me about 4 batches. 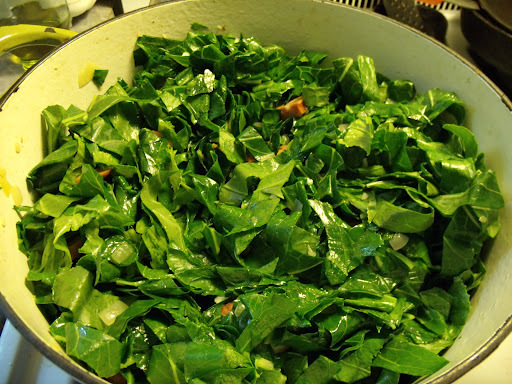 Let simmer until collards are tender and stock is reduced, about 30 minutes. 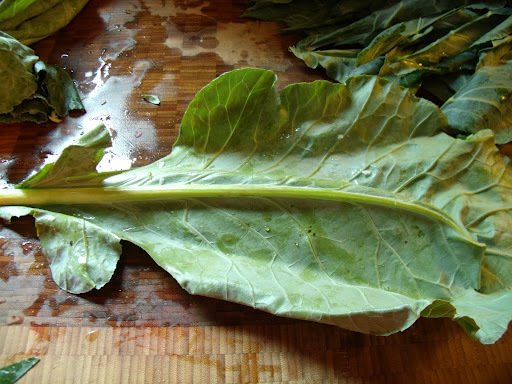 Once collards have cooked. Add cornstarch/arrowroot powder to 1/2 cup of milk or cream. Whisk until smooth. Add to collards. Stir to incorporate. Mixture should begin thickening. Assemble! At this point, take out your biscuits and place on top of collards mixture. They should be slightly overlapping. Grind fresh black pepper on top and place in preheated oven. 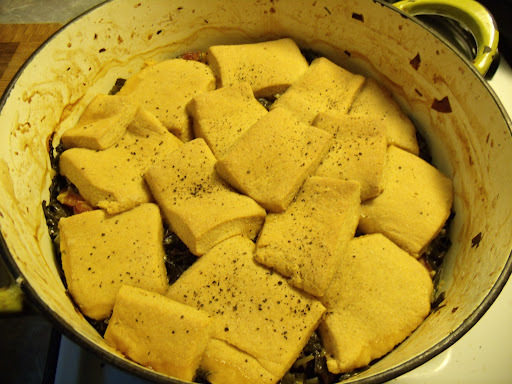 Bake for 40-50 minutes, until biscuits are browned on edges and collards are bubbling. Best enjoyed with a crisp and almost fruity IPA, unless of course, you’re pregnant. Kombucha will do just fine.